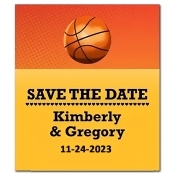 Sports save-the-date magnets are perfect for couples who wish to celebrate their union in a sporty way. 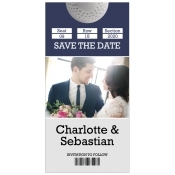 These ticket styled magnetic save the date cards help them to set tones for the wedding day as well. Customized save-the-dates with lovely images of a happy couple will let people retaining it on refrigerator doors. 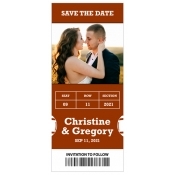 However, a ticket style design adds extra impact to such invitations and inspires people to attend weddings. These magnets are perfect for all loving couples! What connection does sport and a wedding have? They may not be directly related to each other; however they rationally complement each other, if the couple loves sports. Save the date cards make wonderful pre-invitations and they are perfect for announcing the big day in style. 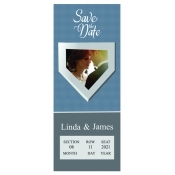 We offer an extensive collection of magnetic save the dates with sports theme designs for couple who wish to make their wedding announcement in a sporty way. It not only gives them a chance to announce their big day in style and at the same time strike with fellow sports fans waiting to be invited to the biggest match of the season! 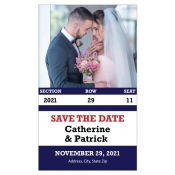 We can produce sporty style save the date designs tailored to match your tastes or favorite sports team (football, hockey, baseball, basketball, college sports team, etc.). These personalized wedding invitations can be sent out a couple of months in advance. Produced on high quality stock material with strong magnetic backing, these sticky wedding invitations are sure to evoke positive responses from expected guests. 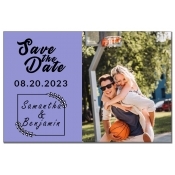 It is not that these save the dates only suit couples looking forward to have a sports themed wedding, in fact it suits everyone who is passionate about their wedding. We offer free full color printing which enable couples to go creative and lavish with choice of colors. There are no extra or hidden charges. Our affordable pricing coupled with high wholesale benefits make couple to order it in bulk along with customized envelopes. 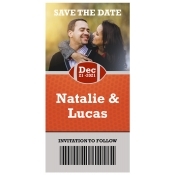 Although personalized save the date magnets are used for sending mailers but couples can easily hand them out during any individual celebrations. 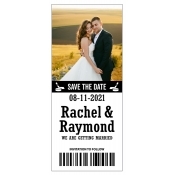 People will be happier to receive a wedding save the date magnet because it ultimately offers them a gala time and they can steal moments for themselves. These sporty save the date magnets will help expected guests to sort out their schedules in an effective way. These colorful pre-invitation magnets are retained as a wedding memoir. We offer free shipping anywhere within the contiguous USA. Additionally, the couple can save on art setup, online design proof and unlimited online mock-ups. To know more about special pricing or any other details of these personalized magnets, feel free to get in touch with our team at 855-762-4638 or write to us at info@cmagnets.com.